Looks good! Just out of curiosity which tire is the new one on the picture of the side by side? 215/60-16 should be about 2% larger than 245/50-16. 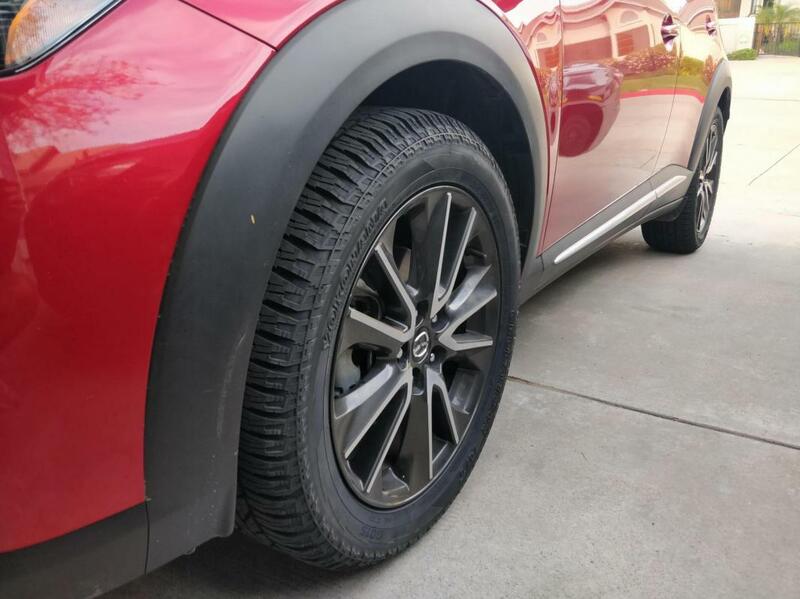 That said, in the comparison photo, the newer looking tires appear significantly larger than the older looking tires. Maybe a typo? The new tire is on the right! Sorry for the bad pic quality it’s on my phone. The left tire is the stock 215/60r16 that had 38k on it. They don’t rub at all but I have noticed my speedo is off a little, not bad though! Do you guys think I can fit 225/65/18 Or 235/60/18 without rubbing? On your previous post you mentioned doing 225/55/18 for about an 1" lift but in reality it would get you maybe 1/2" lift under extremely overinflated tires which isnt recommended for other reasons. The sad reality of this type of "lift" is that unless its a substantial vertical change, its almost negligible because tires have a tendency to "squish" or compress enough under the middle point of the wheel where the main weight is applied downward. Similarly getting a wider width tire but keeping stock oem wheel width isnt going to be a direct vertical sidewall height increase but more of a slant measurement (similar to how a 40" tv is not 40" high although this is an extreme example). Going even further to 235/55/18 (not sure if you meant 225 as previously mentioned in the page before) would push those dimensions even further. You would have to take into account new sidewall height which is about 6mm higher after all calculations from the 225 because the middle value, the 55, is a percentage of the width to calculate sidewall so higher percentage or higher width = "bigger" sidewall (not the same as taller/straight vertical height). Taking most of the dimensions into consideration you would *MOST LIKELY* be ok with 235/55/18 city driving but hitting bumps(possibly potholes) or maximum wheel turning could make contact unless you crawl through it. When I measured my new 16 wheel specs and the tire size in the first post I came close to contact but was able to clear most extreme tests I ran such as hitting low curbs at certain speeds/ sharp turns over bumps/ driving on sand like an idiot etc. Granted its unlikely that anyone will be doing these things for daily driving, but when you decide to go offroad, in certain conditions, city rules and clearances dont apply. You will almost always make contact if you take it through abusive terrain with 235/55/18. What about 215/60/18 it is the same diameter, but a borrower tire. I am going to buy them soon. I need ground clearance asap. I almost lose my front bumper last time, and I was crawling most of the time. I hate to dissappoint you but posting on every tire thread around the forum asking if different sizes fit probably isnt going to get you any answers considering very few people have gone with larger tires and have experience to give feedback if they even run the sizes you are asking for. 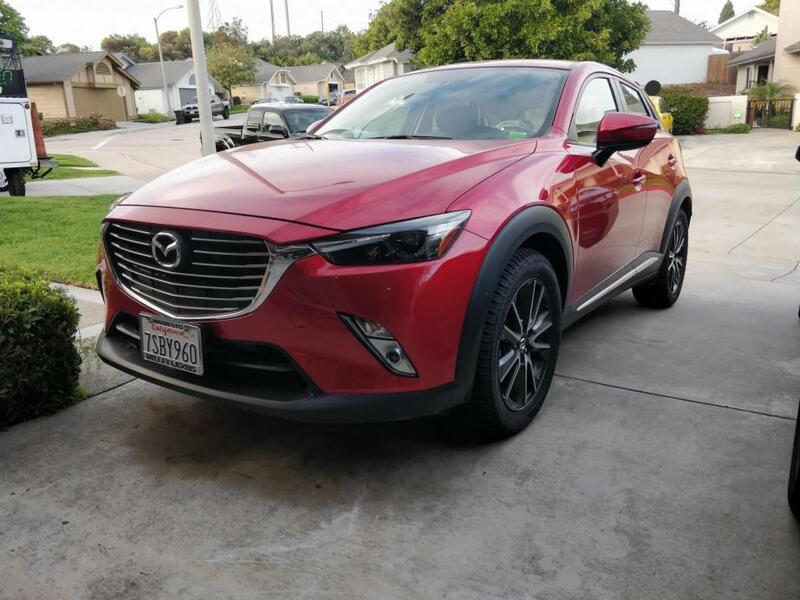 The model is still relatively new (just hit its 4th year)with a growing userbase on the forums but nowhere near as massive as like a mazda3 forum which has over 15 years of production including a performance segment. I try to help as much as I can based on my experience with tinkering but we cant cover all bases. All I can suggest is use a tire calculator site and do some comparisons and measurements of the car and available room with stock tires and see what the calc gives you in numbers for the new tire based on stock/current. I use this for my cars since I had an old tacoma back in the day yet still applies to most cars based on its algorithm but you can find others too. I cant stress the point to do measurements yourself and to not believe people in the internet that give you a "probably" answer without seeing proof of their words. That being said I think youll have more trouble with rubbing with that 215/60/18. I ran the number in comparison and while we cant use the sidewall height numbers since its different naturally for 16 vs 18 size wheel, the overlay says its slight larger than this guy's 215/70/60 who said hes already hitting the fenders and has the black plastic trim popping out. If you are really hurting for front clearance the lift kit thread from earlier will guide you to front spacers but only the front will work. Rear spacers will not work. Its not the best option but probably a more reasonable route if front clearance is an absolute must. Yeah, you are right. I've had miatas, bmw, datsun Zs, and the forums community is in the tens of thousands. 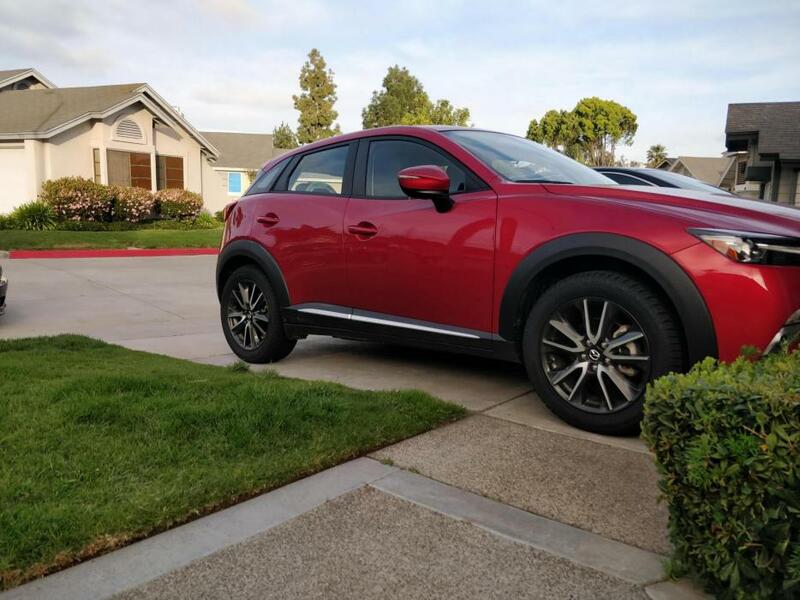 But I understand, only one or two thousand cx-3 where sold, so a smaller community is expected, I slowly starting to learn that. Anyways, back on topic. I had not seen the 215-70-16 thread about his fender popping off on every bump. I think I going simply order a set of 225/55/R18 Yokohama G015. They are slightly larger than yours, but I don't think I get anything larger than that, and I can't even find a A/T tires for 18 in rims. I'll be ordering by the end of the month. There is $60 mail in rebate right now that might take advantage of it. Thanks again for your help and for your detailed answer. I'll post pics as soon as can. Reasons why stock tires are not alright off of the road haha. Fun part starts at 3:15 and then around 4:05 hes spinning on all wheels even through its such a limited mud spot.